One of the truly delightful corners of Bollington, Beeston Brow is very steep and very narrow and contains a very sharp corner but commands superb views from the higher reaches. 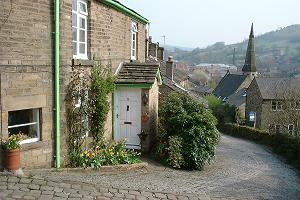 It has along its length a variety of beautiful stone cottages and houses. Approach off Palmerston Street at Bridge End. Leads to Long Lane and Green Lane. Nearest pubs – Holly Bush, Spinner’s Arms. For more see the page on Brows. The corner pictured above is so sharp that it is physically impossible for an HGV to get round, but that doesn’t stop them trying! Martin [Swindells] left Mr. Smith to go into partnership with Thomas Fernley of Stockport. The two partners would appear to have heard something of a cotton mill in a village called Bollington. They drove into the village by way of ‘Long Lane’, ‘Cat-ladder’ & ‘Beeston’ to see the Clough Mill. An extract from information given to Emma F. Brooke by her Uncle George Swindells at his residence, Pott Hall, Shrigley in April 1885. The hillside for about half a mile between Beeston Brow and Nab Lane is known as Beeston and has mostly been quarried for stone. The story suggests that what we today call Beeston Brow might then have been known as Cat Ladder. This is confirmed on the plan of the proposed Macclesfield Canal prepared in c.1824 which clearly shows Cat Ladder in the vicinity of Long Lane and Beeston Brow, although it is not sufficiently specific to show the exact course of the road. Conservation: This street is in the Bollington Conservation Area. Numbers 7-13, 2-10 and Plant Cottage are all subject to Article 4 Direction. 1, 1A, 3, 5 and 5A Beeston Brow ; II, Formerly 3 houses with weaving lofts above: early 19thC.